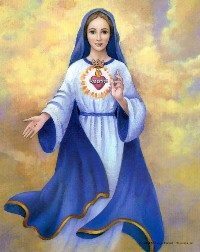 Dear Sons and Daughters, I am your Mom and I come from heaven to call you to conversion. Open your hearts. Don’t let the devil take you away from the Grace of My Son Jesus. Belong only to The Lord, for He alone is your only Way, Truth, and Life. You live in a time of great spiritual confusion. Seek strength in The Lord. Accept My appeals and you will be great in the faith. Don´t back away because of your difficulties. God is at your side. Courage. Know that The Lord sees all. Be honest is your actions. Be sincere in your faith. A Great Sign will appear in the sky of Europe on the feast of a great saint. People will not have an explanation. Pay attention to the signs of God. Don’t be frightened. Those who are with The Lord will never be defeated. This is the message I transmit to you today in the name of The Most Holy Trinity. Thank you for permitting Me to reunite you here once more. I bless you in the name of The Father, and of The Son, and of The Holy Spirit. Amen. Be at peace.